Nightingale Cottage is a charming end of terrace period cottage, situated in the heart of Blackawton with far reaching views across the village and surrounding countryside. 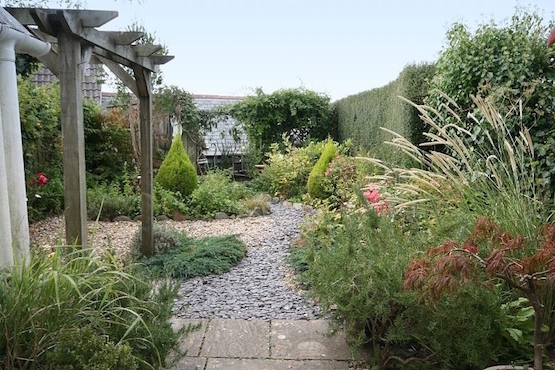 The property is located in a quiet ‘tucked away’ position and offers well-presented accommodation with delightful landscaped gardens and benefits from planning permission to create a single storey extension. The ground floor provides a spacious living room, full of character and charm with exposed timber beams and a large stone inglenook fireplace housing a wood burner. Two windows overlook the front garden. The recently re-fitted kitchen has a good range units and appliances. A cloakroom completes the accommodation on this floor. The pretty front garden has a timber pergola clad with climbing roses and jasmine, and provides an ideal spot for dining and relaxing. Attractive slate and pebble pathways and well stocked flower and shrub borders lead to a timber shed. The rear garden has a raised terrace with decking and an area of lawn with steps leading down to a small courtyard off the kitchen.